You can be forgiven for cynically thinking "Another year, another Need for Speed." Frankly, that's what we thought when the latest title in the series was announced. After all, the damn good Most Wanted just came out a year ago, so what could Carbon possibly offer so soon afterwards that would get our motors runnin'? It turns out that the answer comes in two parts. First off is the Wingman - not the buddy who'll sit with your hot date's ugly girlfriend at the bar - but a crazy fool who for reasons unknown will have no problem destroying his prized car and enduring broken bones just so you can win a race. There are three types of wingman, but all are not equal. We loved the insane daredevil, who wantonly attacks opponents at the player's bidding. But we could have done without the wimpy, shortcut-revealing scouts and annoying draft specialists, who can really only give you a good boost on straightaways - which are rare. Also new this time out is the roller coaster boss race mode in the Canyons. These ridiculously rollicking downhill chases involve a dual-round cumulative suicide mission. You race down twice; once in front, and once in the back, with the follower trying to stay as close to the leader as possible. Whoever gets the most points wins - unless, of course, you hand over the victory by barreling off the side of the road and into oblivion a few thousand feet below. It's a nail-biting, profanity-inducing affair, and can be punishing as hell - but interesting nonetheless. 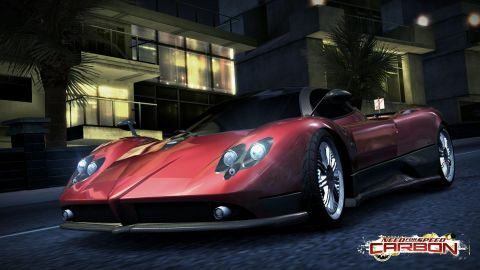 Obviously, the rest of the gameplay owes much more to the street race-y tuner Need for Speed: Underground 2 rather than the more recent Need for Speed: Most Wanted. The only time it really feels like a sequel to NFS:MW is in its story, which is told in that same weird, quasi-animation style and in which some characters return and carry the tale forward. Don't worry, though: if you skipped last year's game you won't be lost at all. You're allegedly took a bag full of money, skipped town, then boldly returned to the scene of the crime. Naturally, former friends are furious and sneer at you, but as true friends tend to do, they ultimately use your vehicular exploits to better their own cause. Description Forget the concrete jungle - Carbon's gonna take you through sweeping canyon streets and force you to claim back the city block by block.